To begin with, I want to go on record saying that I am by no means an expert on Military Jeep restoration. I have done many hours of research (the internet is a wonderful thing) this thread is not a tutorial, I just want to pass on what I have done and learned. For more detailed restoration tips and information I recommend sites like G503.com (and it's sub forum 1943MB.com) as well as many others like Olive-Drab.com. Factory Restoration: This is where you restore everything (and I mean everything) so that it looks just like it did when it rolled out of the factory. 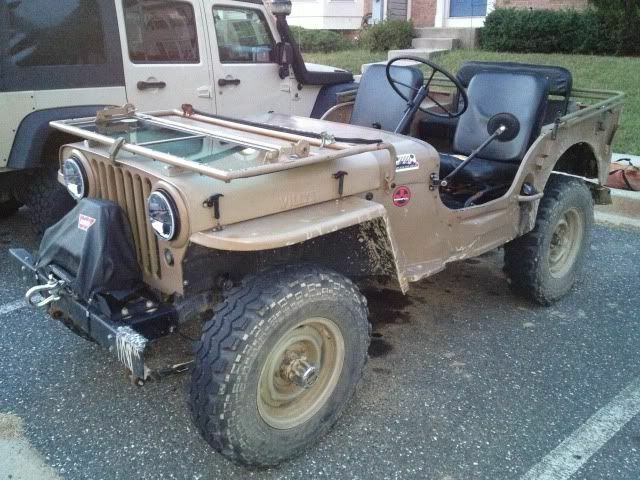 Motor Pool Restoration: Many Jeeps required repair while in military service and OEM parts may not have been available. For a Motor Pool restoration, you sometimes use non-factory parts but they must be something that could have been used during the war. I'm more going with a "Bubba" Restoration: There are so many non-standard things on my Jeep, I'm just going to get it running and to look as good as I can on my limited budget. On the 12th of July, 2013 I found an ad for a "WW2 Willy's Jeep". On July 13th, I bought it for $1000. I literally had to pull it out of a farmer's field where it had been sitting for the last 8 years. 3 of the 4 tires held air but there was no way I was getting the 4th one inflated since it had a silver dollar sized hole chewed into it by gophers. Its body is a replacement made by the American Central Body company with a serial number of 77989 manufactured in June 1943. In the mid 1990s, a husband and his wife, in Phoenix started the process of research to find the Jeep he drove during WWII while in the Army. The husband said he had 2 great loves in his life: "His Wife and his Willys". After 4 years of research, they were able to find the exact Jeep he drove while in the Army. Unfortunately, he passed away a few years later and was never able to realize his dream. In 2005 it was bought by a couple in Camp Verde as a restoration project for their Father. Due to illness, the project was never started and it sat where it had been parked. It's pretty much a "Franken Jeep" cobbled together from various vehicles. The frame is original Willys MB, it has a 1950 flat head 6-cylinder Studebaker engine and then there is the body . . .
A previous owner apparently wanted a tail gate (the MB has none) and the fuel filler on the side (the MB filler cap is under the driver's seat). It looked like he didn't want to go through the hassle of rewiring the dash so he chopped the tub in half just forward of the seats and welded the back half of a CJ-2 on to it. Although I had been told it was a WWII Jeep, I wanted to make sure it was actually a Willys. It took me a while to definitively identify it because many of the identifying features were missing. You can identify an MB frame several ways if, like me you are missing identification numbers, and here are a few. a. Serial number stamped on the engine. The number prefix will tell you the manufacturer. Willys engines have numbers that start with the letters "MB" (MB123456) whereas Ford engine numbers usually start with "GPW" (GPW123456) I couldn't use this since it currently has a Studebaker engine. a. This is a more complex determination owing to the variations in bodies used throughout the war. Before late 1943 Willys and Ford used separately manufactured bodies. Starting in early 1944 one manufacturer (American Central Manufacturing Co.) began building bodies for both Ford and Willys. These bodies are referred to as "composite" bodies because they have characteristics of the earlier Ford and Willys bodies combined into one body type. I couldn't use this since a previous owner had pieced together a military (most likely MB) body with a CJ-2 body..
a. The easiest way to distinguish between the two frame types is to inspect the front frame crossmember that is beneath the radiator. The Ford GPW frame uses an inverted "U" shaped steel member here. It is open on the bottom. The Willys MB frame has a steel tube or pipe type member in this location. I couldn't use this since a previous owner had welded on a straight cross member. b. Another detail to check is the machine gun mount. In the center of either frame, mounted to a crossmember behind the transmission, is a large, roughly circular plate with four holes drilled in it . This is the machine gun pedestal mount. Only WWII jeeps have this feature, and all WWII MB/GPW jeeps were equipped with this plate. The plate for a Ford is oval and Willys has a round one. BINGO! Even though a previous owner had chopped it up to fit a CJ-2 tub, you can still see it is round..
One of the first things I did was remove the body parts (tub, windshield, hood fenders & grill) so I could see what I had. Additionally, I was able to get a replacement tub from a local military vehicle surplus place. It's not pretty, but it's a WWII military tub and it's workable. I'm still a long ways from being ready to install it, but I got some new data plates. I was told it was running before it was parked 8 years ago so I haven't torn the engine down. All of the fluids looked clean so I replaced them along with all hoses. I also replaced everything in the ignition system and had the starter and generator rebuilt. I've temporarily wired it up but still having a hard time getting it started, I have to trouble shoot the system. At least it turns over. I've also rebuilt the brake cylinders (master and all 4 wheels), replaced the brake shoes and turned the drums. The brake drums look original or OEM replacement. They still have OD paint on them and you can see the slot for the feeler gauge for adjusting them. Driving a jeep with a top is like screwing wearing a prophylactic. Maybe a little safer but doesn't feel nearly as good. What a find and keep up the good work! So that's what a real one looks like! That is sooooo sweet. Ya, I think some bondo and plasti-dip and it'll fix right up. Okay, so the last few days I've been busy. I had already re-built my front brakes and main brake cylinder so now it was time for the rear. I re-built the back brakes, pulled both diff covers to check the gears (they looked good) and replaced the front pinion seal that was leaking. I also checked the trans and gear boxes and topped off the fluid, they looked pretty good. Almost ready to start the body work. My front brakes were just on the edge of calibration limits and I couldn't get them turned. The read drums, however had one more turn in them so they are good to go (new front drums waiting on money). This build is fantastic. You are one talented boy. Please keep the pics and updates coming so we can see the step by step. Awesome works so far. I look forward to seeing the rest come together!! I have thought about doing something like this for years (and occasionally browse CL and other local sites for a gem like this), but getting relocated every couple years would make it difficult. I think I will live vicariously through you for now. Honestly, it's probably a good thing we don't live in the same neighborhood. I'd probably never leave your driveway!! Okay, so I'm done with my chassis and drive train for now. I still haven't gotten it running and the frustration meter is pegged so I've decided to move on to the body work. The replacement tub I acquired looks pretty rough but for the most part is pretty sound. Back in post #2 you can see the composite tub I have to work with. I did some research and determined it was manufactured by the American Central Body company in June 1943 so it's only 6 months newer than the chassis. The only big rust spots are from the cross member of the hat channel, the side piece where the shovel goes and a hole in the rear panel. The side piece and hat channel rust is typical in WWII Jeeps. When they designed the WWII tubs, they had u-shaped channels under the body for added strength. To add rigidity and to save weight (the govt. contract specified a max. wt of 1,300 lbs empty) they filled the channels with wood. Okay, you know where this is going. I've removed the hat channels and hill have to wait on replacements since they run $120-$180 not including shipping. I have no idea why a PO cut a hold in the rear panel. It's right under where the spare tire mount goes. The metal is sound so it should be an easy fix. Funds being what they are, even though I'd love to get it sand blasted (~$250), I'm just using paint remover and a rotary sander to get the paint off so I can see what I need to repair.. Wow, there is like 8 layers of paint there. As best as I can tell, it started out O.D., then gray, blue, red, O.D. again, yellow, and finally kind of a black and white tiger stripe that had been applied with a brush. I took it down to bare metal in most places and then put a layer of primer on so it didn't rust any more while I was working on the dents. Also, it has allot of extra holes and brackets that have been added throughout the years. I've been cruzing the interwebs to try to figure out what stays and what goes. I built and daily drive a 1945 cj2a. It's very close to your jeep and many of my parts are military. Good job so far! Don't cut corners! Take your time. It's well worth it! Good looking Jeeps. I wish I had the time and money to do a build like that. Someday. Just an update on my body work. As I stripped the paint an bondo off, I discovered it's banged up a little more than I first thought. No problem, it will just take more hits with the hammer. I've been working on patching the areas that have rusted through. I patched the hole in the rear panel and all of the rust from the hat channels so all I have left are a few small holes and the shovel channel on the side. Give me a break on my welds. I've taught myself how to use this Harbor Freight wire feed welder. The welds aren't pretty but they are strong. The good thing is that they can all buff out. You gonna weld up all the extra holes that have been drilled over the years? Ya, I'm in the process of researching what goes and what stays. Okay, I did some tub fitting today. I still have a long ways to go but since this is not the tub that was on the chassis when I bought it, I wanted to see if I need to make any modifications. I got everything together and some friends helped set everything in place. My biggest worry was that the after market 6-cly engine wouldn't clear the fire wall. After I got things in place, I was able to see the firewall would clear (barely) but for some reason the PO had raised the transmission and transfer case so the tub won't fit down over them. Now to figure out the best course of action. No pictures today (but allot of emocons) but wanted to share my "w00t" moment (everyone in the house is still in bed so I have nobody else to tell). I've gotten back to trying to get it started. I had a face palm moment a couple of days ago . As mentioned, since I'm having to create my wiring harness from scratch, I couldn't get the thing to run. I felt like I was beating a dead horse and was about ready to give in and take it to a mechanic to trouble shoot it for me. I had replaced or rebuilt everything in the electrical system but realized I hadn't touched the carb! You would have thought I'd have thought about that before since it had been sitting for 8 years but noooo! Anyhoo, I bought a rebuild kit for the carburator (discovered it was a mid to late '60s Ford) and rebuilt it. It smokes a bit and I need to fine tune it but I got it running. Now back to the body work.